When we want to say that someone is duplicitous, we say they are “two-faced.” We might use the word “muti-faceted” to describe a well-rounded person, to say that there are many sides, or “faces” to him. 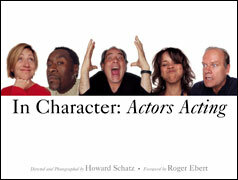 Rainer Maria Rilke once said that: “there are quantities of human beings, but there are many more faces, for each person has several.” In his book In Character: Actors Acting, Howard Schatz portrays those who make a living presenting different faces. In portraiture, the photographer is often asked to capture and distill the many faces of a person to a single image. There are really two main approaches to portraiture: portraiture as collaboration between photographer and subject, and portraiture in which the photographer acts upon a subject. The latter can be illustrated by photographers like Richard Avedon, who famously confronted subjects like writer Isaak Dinesen and the Duke and Duchess of Windsor, to portray them in ways that were less than flattering, but in ways that he felt showed them stripped of veneer. (Ironic for someone who fashioned much of his reputation initially as a fashion photographer.) Avedon has been described as being more akin philosophically to a sculptor, working on subjects almost as if they were stone or clay, to be struck or molded in his vision. A pleasure of Shatz’s book is that it allows us to really see the physical skills of some of these actors. It is no accident that many contemporary actors still admire the genius of silent actors like Charlie Chaplin. Likewise, who better than an accomplished still photographer to believe in the ability of a person to emote without words or sounds? Theater and film directors giving actors guidance, but also give them space in which to interpret their characters. Richard Dreyfus, Jason Alexander, Danny Glover, Hal Holbrook, Ellen Burstyn, James Earl Jones, Peter Falk and Kelsey Gramer are among the actors that headline Schatz’s project. As Roger Ebert notes in his introduction to the book, Schatz works close to the actors on this project, in closer quarters than we might even see them on the small (television) and large (movie) screens. The way the actors’ faces fill Schatz’s lens is as if we were sitting in a café or diner across from them. It is a distance that at once calls for both clarity and subtlety. (Ebert admits that those absorbing the book might find a bit of overacting in an actor or two.) In some of the “performances,” the actors’ visages fill and bleed off the page, for instance, when Elliot Gould is in a “high stakes poker game, holding four aces.” The best spreads, though, are those where you see expression after expression after expression, as in the multiple poses of Melissa Leo or Nestor Serrano, which show us their acting ranges. We gain further insight from the actors’ notes that accompany each profile. Schatz’s project is wonderful, his photos enthralling, but many of the directions are more like the scenarios an instructor might give an acting class. This might be a quibble, but would we have seen an even higher level of acting if Schatz had taken his acting challenges from well-known scripts? This book review first appeared on Takegreatpictures.com. Part III of the interview with National Geographic photographer Michael “Nick” Nichols, who is organizing an event called Look 3: Festival of the Photograph in Charlottesville, Virginia. Wayne: You’ve attracted both the photographers and the sponsors to make this event happen. Speaking of sponsors, how do you keep the commercial side from overwhelming the event? Additionally, will some of the photographers, at least the younger and emerging photographers, want to know more about the business side of photography? Nick: As we grow, we’ll try to have discussions where you can have that. Or you can also just meet in a coffee shop to talk about it. But this is not going to be the kind of place where you’re going to find the great tripods, this is not the kind of place where you’re going to find the nice lighting devices. It’s really how we set the table. One of the evening events we’ve added is having Sam Abell, who is a great storyteller, go on the stage, kind of like Mark Twain, and tell stories about pictures. All the events that we’re putting forth are [for] celebrating the images themselves. We’re not celebrating the trade or the tools. Wayne: Going back to this lineup of photographers that you have, they include a lot of people that you say you personally admire. Is there anything that you specifically sought out in each of them—a particular diversity of viewpoints and styles? What was your thought process on that? Nick: If you look at the genres of the three very simplistically—Bill Allard is a color photographer that photographs the world, but in a lyrical way. Bill’s not carrying an agenda. And Sally is a fine arts photographer who photographs the world around her, just literally around her. And then Eugene is a social documentarian who photographs the issues of our time in as straightforward a way as possible. That’s my world covered in a nutshell. It’s the world of photography that I love, personally. But I think a lot of us love that. There’s a whole lot of us who make a living doing what you would call editorial photography, who love fine arts photography. And there’s a whole genre of fine arts photography that likes to photograph real moments. Then there [are those] photographing the global community. Allard is kind of a voice of [that]. The difference between this [event] and [those that have been in] my backyard is that we’re really celebrating, in a great way, Sally, Eugene and Bill. Eugene’s show is called “Thirteen Books,” and it’s going to have his book process laid out for you, and how he carried those [book] dummies around in a bag for years—some of them were just glued together on paper. Sally’s is going to be all wet plate stuff—and new stuff [“Recent Photographs”]. Bill’s is literally “Five Decades” of color photography—back to Kodachrome 25. I think the shows are going to be something very special. All the other work that we’re showing, like the Work Night and the Shots Night, [will be] nominated by our board of advisors. [The voting will then include Nichols] and our master of ceremonies Vincent Musi, who is a really good photographer and historian. I have hundreds of nominations that I have to get down to something that we can show on Friday and Saturday night. And I know I have to make these entertaining. But I’m frustrated that [we have not yet figured out how] everyone who comes [to the event] can show […] work. If we have a thousand people, that’s pretty hard, but even if we had 300 who wanted to show their work that would be pretty hard. We’re going to work at that. That’s why I’m interested in Lightstalkers, because in Perpignan, the Lightstalkers [members] who found me were all like the people who showed up in my backyard. I really don’t want people to think of this as an elitist thing. We’re going to find a way to show work, we just don’t know how to do it yet. Maybe one year we add an extra day. Maybe we have a big field we find out in the country. Wayne: What else are you hoping to accomplish in the future events that you’re not going to be able to accomplish this year? Nick: One of the things that the team is pushing for is more print exhibits. Perpignan does about 40 exhibits. It’s a real gift to the world and community. There’s a huge expense there, and I’m cautious about taking that on. Jean-Francois Leroy, [the director of “Visa Pour l’Image” in Perpignan, France] it’s a full-time job for him, and I’m still trying to have my photography. I’m determined to have that. I think I would die if I didn’t have my own work. I hope that this festival grows around us. We keep the core, and we do the core very well, which is the “[Insight] Conversations” and the shows for the legacy bunch, and then the two big projections. I think we’ve got a really good heartbeat. We have to establish our identity, while we’re still being perceived, but I would like for it to [eventually] grow on its own impetus. I would really like to do DVDs and books of the three photographers and of the festival. So in year one, there would be a book that you could buy that had the festival, all the cool documentary pictures that people shoot while they’re at the festival could be part of this, plus work from the three legacy photographers, so a kind of greatest hits of the festival book on DVD. But right now, if I put that on the table, I would have to negotiate with Eugene and Bill and Sally about their work, and I can’t do that. What I tell them is that anything we do, you get more than your fair share of. So you see, it’s kind of a trap. If I want to market the festival, and when I say market, what I really mean is document: because if we can only see the 1,000 people in the Paramount, that’s a moment in time that may never happen again with Sally that we should get out there. But it becomes a promise then. If I can find a way where these things don’t threaten the artist, and they don’t feel like I’m exploiting them, that’s one of the big growths that I would see. I would love to make these things available to universities, then we could be in curriculums, we could be used. Then it would be really worth the photographer’s time to come and be one of the legacies. You’ll see this in your own career if you haven’t seen it already. As soon as I feel like I’m being exploited, I want my piece of the pie. If I see that everybody is a volunteer and no one is making anything, I’ll give you 500 percent. But as soon as it becomes a product, then I’ve got to have my eight percent or whatever it is. So I’ve been very cautious about that. But I desperately want to document these things. And we will document them, but we won’t market it until we have the permission of the artists, and I’m not even going to ask for permission until I can show them that this festival really is what we’re telling them. Wayne: Can you talk a little more about why you feel it’s important to give back to the photographic community? Jon Golden: We’re creating a space where the education and the passion, all the things that got us into photography originally, are all there for three days. That seeing the print come up in the developer for the first time. The magic of that. Sometimes when you work, and commercially, you sometimes forget what got you involved. We’re trying to create [a place], where all this passion and all this magic and all the reasons you became a photographer, are there for you to enjoy and celebrate and “live in.” Let’s step away from what you do, all the pressures in life, for three days, just to be in the [photographic] zone with the rest of us. Nick: What Jon says takes me back to Magnum, and the conversations we used to have all the time. Once you get into this as a business, it’s rare that you do what we’re talking about here. At Magnum, there was always someone who would say at the end of the meeting, “We didn’t talk about photography. All we talked about for four days was how to pay the bills.” And we would fight and fight, because paying the bills puts pressure on you. Every year someone would say, “is that why I got into photography?” I think about the phone conversations with my colleagues now, it’s usually about rights or how we’re going to archive our pictures or business. It’s once in a blue mood that we talk about the work. And we don’t compliment each other, either. It’s the weirdest thing, rarely will photographers say, “goddamn that was good.” We don’t do that with each other, it’s just the weirdest thing. Let’s get away from the noise for three days, and let’s just look. When we would do the backyard—this would go on from dark until two or three in the morning, Allard would always look at the first set of pictures and look at the last set of pictures. She designed a logo. You know, that’s what a great designer does. And she even coined “three days of peace, love and photography, because after their fourth meeting with us, that’s what she saw was coming. She saw that’s what we were trying to do. That’s what a great designer does, they see you, and they try to sum you up in a few words. It’s the three days of “peace, love…” Woodstock is a hippie thing, but it’s this time, and the way the world is going, it’s not a bad thing to have this year, I tell you. Wayne: A lot of photographic events here in the United States are focused on equipment than on imagemaking. You wanted to create a venue that was focused on photography itself. What kind of discussion do you want to see the event inspire? Nick: Off the street, Charles Moore the famous civil rights photographer—black & white [film] guy—helped my career. And I’ve always felt like, wait a minute, that’s what we should all do for each other. He saw something in me, it was just about pictures, and he encouraged that, and I’ve always tried to do that with young photographers, any photographers I come across. I teach workshops. And one of the things I try to define early on in a workshop is do you want to be “me,” and if you want to be me, I’m going to be really tough on you, but if you just want to be a photographer and take better pictures, then it can be more relaxed. If you’re telling me you want my job, then I’ve got to be rough on you because it’s a rough world. The last thing I’ll ever talk to photographers about is my equipment. I get forced to sometimes. And I love the equipment, but I just want it to be there. I see photographers on the sidelines at sporting events—it used to happen to me when I was a young photographer—people would want to talk to me while I was working, and I’m like, “What? I’m in the zone. I’ve got to put 500 percent focus on [what I’m doing].” There’s a club of photography that I’m not interested in, that club that’s just talking about the business of it, all the peripheral noise. Wayne: Can you explain what you mean by “inside conversation,” by making the conversation introspective? Nick: When you give a talk, you’re limited because you stand there, and you show your work. If [instead] you sit down in a chair with Alex Chadwick, [who is a] world class interviewer, [he] doesn’t insert his personality. He tries to bring out the essence of Jim Nachtwey or the essence of Elliott Erwitt. We did it this year [at the National Geographic seminar] with Jim about his new project he shot for Geographic on war medicine. It’s very hard for Jim Nachtwey to talk about his work because of the subject matter, and he doesn’t want to [converse?] on it. It’s all about what’s on the screen. So even though he didn’t say much, what Alex brought out of him in that hour was very much more than what he would ever say to us if he were talking to us directly. By Alex saying, “Well, Jim, you know, your pictures are disturbing,” …and I think that’s all Alex said, and then Jim was like, “yeah, well, they’re meant to be disturbing. War should be disturbing. We should be disturbed by war.” If that’s all Jim Nachtwey had said in an hour, that would have been enough. Wayne: Clearly, you have an impressive lineup of master photographers. Can you talk about how each of them became involved? Nick: I’ll talk to each one, because they’re so individual. The first thing I had to do was come up with these three [photographers]. I talked to Bill about it, and Bill being from here, and at the point of his career here, he was like “great, yeah.” Bill sees this as a retrospective of his life. He’s calling his show “Five Decades,” five decades of shooting color the way he shoots it. If you go back somewhat Bill is as contemporary as he was then. Eugene said, “when I first went to [the photography festival in] Arles, we sat in chairs, propped up our feet and talked about photography. Maybe your festival will be like that, for a while anyway.” So you do have a moment in time, you do have your brief, our three days of “peace, love and photography.” Maybe Eugene will be able to sit and prop up his feet with somebody. National Geographic photographer Michael “Nick” Nichols is organizing an event in Charlottesville, Virginia, that he says will celebrate photography. The event has its roots in the informal 1980s gatherings that Nichols and his friends hosted in Berkeley, California. The gatherings then moved to Charlottesville with Nichols, who hosted them on his backwoods property. This year will be the first time that the gathering becomes a formalized festival to be called “Look 3: Festival of the Photograph.” Sally Mann, Bill Allard and Eugene Richards headline the event. Nichols explains how the event has evolved, and what he and the event’s other organizers hope to accomplish. “We’re in our first year, so we’re not going to be perfect.” He welcomes ideas on how more people can show images at the event. The “overwhelming” goal is to create an intimate festival that is “about the image.” Part I of the Interview. Wayne: My understanding is that the event has its origins in informal outdoor gatherings? Nick: It started in my loft in Berkeley in the ‘80s. The Bay Area photographers that were around, editorial photographers Frans Lanting, George Steinmetz, Ed Kashi, all of us in the early part of our careers. Like Lightstalkers without the Internet. But at the same time, carpenters and doctors and philosophers, anybody that came would show their work. The philosophy was that whoever showed up could show their work. And when we moved to Virginia, we started doing it in our backyard [in] downtown Charlottesville and that’s where I met Jon, [Jon Golden, a photographer friend of Nichols, who is the Technical Producer for the festival] . It started out with maybe 100 people, and it got so big. And then we moved to the country, and I think the last one probably had about 500 people. We always talked about having a festival, but we were afraid of it. It’s a huge task. But the genesis of [the event] was [that it was] always for the community, and by community, I mean the community of photographers—which is what I presume Lightstalkers really is. The idea that you could show your work at the same time as Bill Allard and Dave Harvey [David Alan Harvey] was very cool, there was some networking that would go on. The last one was so complicated because you had to raise money—and the amount of food we had to provide—we had something like 350 people camping on the property—we just decided that maybe we should move to a real festival. We were missing the business aspect. I didn’t want to become a businessman, and Jon was [just] going to take care of making the screenings and that part of the work. Luckily, a local philanthropist stepped up and said, “wow, that was a cool party, maybe we should do that as a festival.” Her name is Jessica Nagel. She’s been helping me sell it, finding business partners. A huge amount of this is dealing with the town, and how we get the venues and all that stuff, they’re really handling that. Wayne: How supportive has the town been at this point? Nick: Overwhelming. Charlottesville is a historic town, it’s got a big university, so there’s an intellectual element and an art element. About 20 years ago they paved over the downtown and made it walking, and planted some trees and started the evolution of a rebirth of a downtown. We’re coming along at just the right time where we can mimic Europe to some degree. I hate the sprawl in the United States, I hate the way we grow here, so we’re trying to make this festival so that once you get here, you never have to get in a car again, and you can see everything within a few hundred meters, literally. The overwhelming goal is to try and make this thing intimate. In Perpignan, one of the best things about it is sitting around in coffee shops and talking to people. We want to be able to have that aspect. The town hasn’t given us any money yet, but I suspect next year that they might. Wayne: You’ve talked about the intimate feel of Perpignan, and the fact that you’ve started out informally. What else are you trying to do to keep that intimate feel, that kind of backyard [atmosphere] that you have had? Nick: That’s the scariest part of this for me, because you can’t be uncurated anymore. I can’t have a stay until four in the morning policy. Now that we’re dealing with the real world, all of a sudden you’re dealing with those restrictions. That’s one of the frustrating things for me, that we can’t have everyone who comes show work. [Nick hopes for ideas from the Lightstalkers community. He says that a lot of Lightstalker members were young /emerging photographers with an enthusiasm “like some kind of virus running around.”] We do have an exhibit space called “Your Space,” and everybody who walks in there can have a print made and hang it on a clothes line, that’s kind of mimicking ““Here Is New York,” [a “democracy of photographs” created to document 9/11]. Of course, the work won’t be as cohesive. As “Your Space” grows every year, we can come up with a theme. I really want the idea of [young and emerging photographers like those on Lightstalkers] sitting around, showing work and talking about it. Because that’s the thing of the festival that I’m most concerned about losing. Wayne: You’ve talked about the fact that a lot of logistical concerns have helped propel you to think of the festival in more formal terms, but was there anything else happening in the photographic world that was an added impetus? You were talking about meeting these hungry young photographers or people who are looking for venues for their work. Nick: Exactly, when I started out, there was a rebirth in picture magazines. Life and Look [magazines] had died, [but] when I came along, Geo was stimulating the world, Life came back. Nowadays when I meet young photographers and I see them frustrated—trying to have my job—you know, I’m still at the top of my game, and I’m thirty years in, I’m not passing along my position. I think something like this festival [will help encourage] photographers to build their own groups. You know, when I was in Magnum, I felt like, “God, there should be hundreds of Magnums. Why is there just one?” If you have seven photographers, you’re seven times stronger than if you’re one. And they just haven’t proliferated. It’s hard to keep going, I guess. One of the ways that you deal with the Gettys that swallow this industry, and the fact that there aren’t that many publications that publish the work, it’s having something like this to celebrate [photography]. Perpignan is a place for that. [While] I want to make sure that we’re not “Visa pour L’ImageEast,” we’re not the “Redneck Perpignan,” even though that’s a fun name to use, we’re really set up to celebrate three great photographers every year, and use that as a reason to gather. I’m all about the image, not all the other stuff. I love looking at pictures, and I really feel like that’s what we want to be about. We’re going to try to show the work in the way that the photographer wants it to be shown. You know, when you give your work to a publication, you kind of give it up. The photographer will drive the way that the work is shown in this festival. The industry has changed, [but] I want to be able to say to people who take pictures, “Don’t despair. What really counts is the image.” I know we have to make a living, but the bottom line is the images. Wayne: It looks like you’ve made a lot of effort to keep things, I don’t know what the proper word is, but let’s say “democratic.” For instance, you’ve kept the festival passes at a surprisingly modest price. Wayne: Neither have I, so I won’t be able to call you on it… broadly speaking, though, what kind of photographer are you hoping to attract…? Nick: The perception of Sundance 15 to 20 years ago was that it was for the work. And as long as I’m involved with this thing, as long as I’m alive, it’s going to be about that. If you see that I’ve quit in anger, it’ll be over that issue. I don’t want so much control, I don’t want to control the images, but I do want to get to a certain kind of photography. I’m afraid to preface too much, but I believe in the moment. The kind of photographer that I’m trying to attract is those who want to take images that “happen.” I prefer photography where things happen rather than images that happen on a computer. If you look at Sally Mann, Bill Allard, Eugene Richards, if you made a photographer out of those three, that would be the photographer we’re looking for. 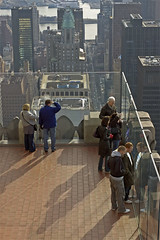 I was walking around Rockefeller Center over the weekend when a ticket vendor came up to me and asked whether I had been up to the Top of the Rock before. I hadn’t. Would I be interested in a $5 discount? I would. A major reason why I hadn’t been up to the Center’s observation platforms before was because the face value of the ticket was a hefty $17, and while everything in New York is expensive, $17 goes a long way towards other city pleasures as well, like a decent meal, for instance. Anyway, the vendor was offering me $5 off ($5 is not what it used to be; most magazines on the newsstand now cost easily more than that, but it will still buy you a copy of The New Yorker), so why not finally go up for a “look see.” Plus, he buttered me up by claiming that he could tell I was a New Yorker, not a regular tourist, since I insouciantly had my hands in my pockets (despite the fact that I had a camera bag and a post-World War II era camera slung around my neck). Well, actually, he didn’t say, “insouciantly.” He said that I looked “cool and all,” or something like that. Was there a long wait, I asked? No, he said. That sealed the deal. I can safely say that the Top of the Rock (as Rock Center calls its observation area) smokes the Empire State Building’s observation deck. Anyone who has been up to the Empire State Building before knows that the hour-plus-long process for going up to the top feels like a cattle call. 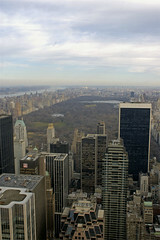 At Rock Center, after a quick security check, you’re whisked within minutes to the first observation deck. 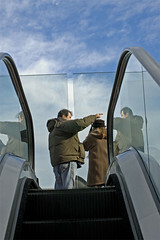 Along the way the staff actually greets you from where they’ve been strategically placed at each elevator, escalator or turn of the hall to guide you. The day was overcast, so I didn’t get the great shadows that I saw during my visit to the deck of the Empire State Building, but getting a chance to look over the top of Manhattan seems certainly to always be a treat. A guard I chatted up told me that part of the observation area used to be an office for boxing promoter Don King, while the rest of it had been used as storage for the Rainbow Room! In between sheltering himself in a doorway from the brisk cold, an event photographer at the top asked visitors who had forgotten their camera if they wanted their pictures taken, and he was well placed when a young man dropped to his knee to propose to his girlfriend. I snapped two images too, not anymore than that, though. I didn’t want to encroach on the event photographer’s space, plus isn’t it a little unbecoming to be in paparazzo mode when a young couple is getting engaged…? I’m not crazy about the photos I’ve been taking with my Zorki and its collapsible Industar 22 lens. I’m not sure if the shutter speeds are slow or the diaphragm settings off, but both rolls that I’ve run through it so far have been overexposed. I’ll probably take my Fed 2 for my next spin instead, since the first roll I ran through that camera came out better. These little excursions remind me that I don’t get around the city enough. Having a newborn son contributes to that, of course, but you have to take advantage when you live in one of the most photographed cities in the world. 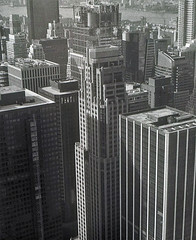 For inspiration, I’ve recently been looking through the New York photographs of Andreas Feininger and Berenice Abbott. (Can’t forget to mention Andre Kertesz, who will always be one of my favorite photographers of New York scenes.) 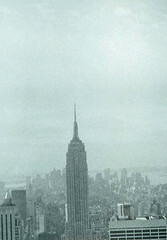 Abbott had some of her photos collected in a book called New York in the Thirties, while Feininger did a follow up called New York in the Forties. The drab print quality does not do any justice to their images, but it’s still useful to look and see what subject matter captured their attention. Abbott, who had a pilot’s license and adventurist spirit, had somewhat of a daredevil reputation. She was known to often crawl out on the gargoyles of the Chrysler Building, where she had an office. The son of painter Lyonel Feininger, Andreas Feininger studied as an architect under Le Corbusier. You can see the focus on geometrical lines and shapes in his photographs. Travis Ruse shows how you can take your daily mundane commute, and convert it into photographic opportunity. (Photoshopsupport interviewed Travis last year.) Travis’ project is very different from Walker Evans’ famed Many are Called project, where Evans (supposedly) surreptiously took photos of subway goers with a Contax camera. It is always a scary moment when I raise my camera to take a stranger’s photograph. I seldom ask for permission. A friend once said, “To seek permission is to seek denial.” If I stopped to talk to the subject before I made the photo, the moment that I was drawn to would be gone. My policy is that if I take someone’s photo and they express their displeasure then I will not post the image. That has never happened. I also feel that since the intent of this project is to celebrate the subway commuter no one would be offended by the images. I’m trying to tell a story, our story. What it’s like to live in NYC in 2006 and commute on the subway. I also carry business cards with the website address to hand out. I’ve gotten some great feedback that way. Given how many hours of my own day are devoted to trains and buses, it’s a good lesson on how good photographers can pull out moments from the most mundane periods of daily life.